Bird Feeders Made in the USA by Looker Inc. Our clients include over 650 specialty stores nationwide. 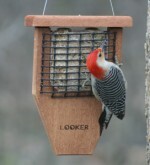 Looker is a leading manufacturer of Suet Feeders. Holds 2 suet cakes and 3 cups of seed. Hangs with a coated cable. 8" x 9" x 8". Room for a pileated woodpecker. 8" x 2" x 11". Holds 2 suet cakes & 5 cups of seed. 12" x 7" x 8". Brown body with a green roof. Holds 2 suet cakes that are separated with a divider. 6" x 5" x 7-1/2". Brown bottom with a green center and top.